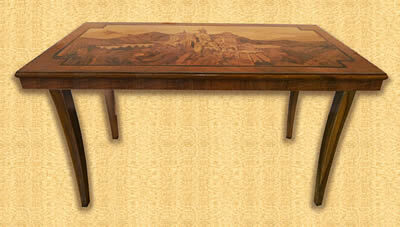 January's update brings you a superb example of a Buchschmid and Gretaux wood inlay coffee table. 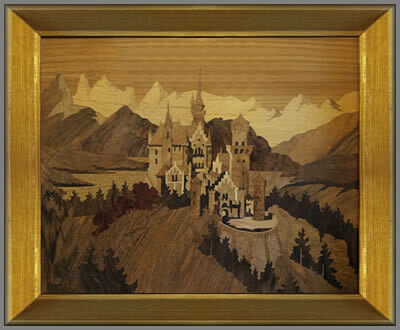 You will have seen Neuschwanstein Castle displayed in normal picture form, but it is unusual to see it as an inlay on a table. .
Our January update brings you a superb example of a Buchschmid and Gretaux wood inlay coffee table plus three BG pictures. These are all owned by Greg Anderson and we are pleased to say that Greg has given us a most interesting story of how they came into his ownership. These are lovely pieces and we have to admit to a level of envy, especially of the coffee table. 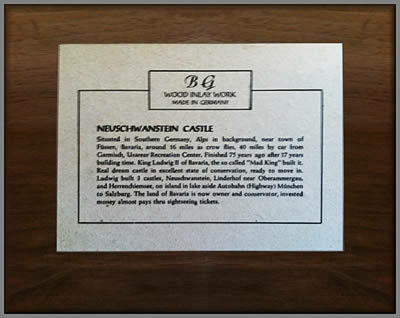 "A few years ago I was given an inlaid coffee table from my mother which depicts Neuschwanstein Castle with the initials BG in the lower right corner. I remember the table being in my grandparent's house when i was growing up and have always been fond of it. 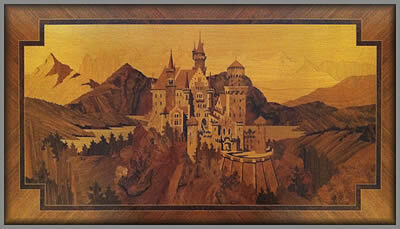 Recently, my grandmother found three 13.5"x11" (with frame, the inlay itself is 11.5x9) wall hangings that depict Neuschwanstein Castle, Ludwigsburg Palace, and Regensburg Cathedral. 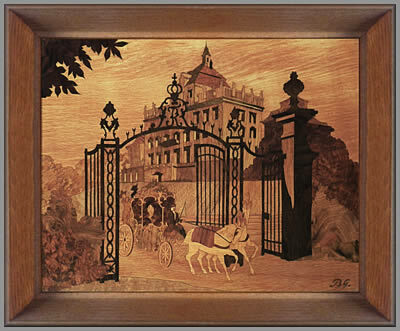 She was of the impression that all three of the wall pieces were buildings commissioned by Ludwig II. Apparently my grandfather was stationed in Berlin after WWII. He visited Neuschwanstein Castle a few times and became fascinated with Ludwig II, saw the table in a store and saved money for months to buy it. My grandmother doesn't remember how much it cost, just that my grandfather was so excited when he finally brought it home. The wall hangings were purchased a few months apart later that year. This was sometime around 1963 as best we can tell. After doing some research it seems that all 3 buildings were made by different Ludwigs: as you can see in the placard attached to the Neuschwanstein Castle wall piece, Ludwig II did indeed commission that castle to be built, however, Ludwig I built Regensburg Church while Ludwigsburg Palace was built by Duke Eberhard Ludwig. Somehow all of the pieces have survived in excellent condition, but none of the research we've done on the B&G company comes up with a rectangular coffee table such as the one I now own. I've gotten a fair estimate of the value of the wall hangings through your website, but I'd love to know more about the coffee table and if there are others like it." 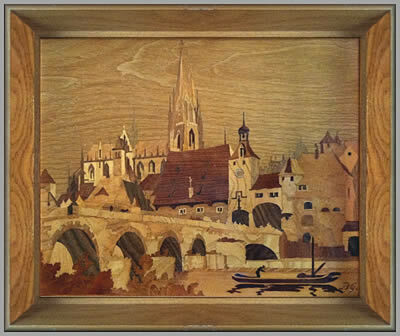 We have to say that the Regensburg Cathedral picture is a new Buchschmid and Gretaux wood inlay piece to us, this is one we haven't seen before. It seems to be one of their smaller series, but is very attractive despite all that. 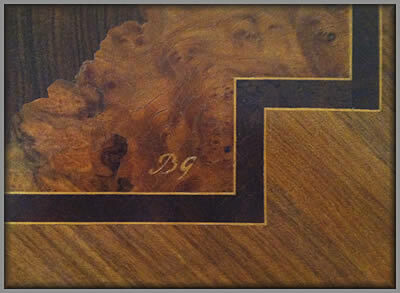 As to the rectangular coffee table, well once again this appears to be one of the Buchschmid and Gretaux wood inlay 'specials' where the anticipated maximum amount in circulation would be ten examples. But never forget that this could also be an exclusive 'one off' which was made to special order. Unfortunately all of the records from the B&G sales went with the passing of Otto Chlup, so we have no company written records left to refer to. All of our documentation now derives from BG catalogues, the information Herr Otto Chlup gave us when he was writing for us, and the information you, our web visitors, give us along with your and our own observations. We are generally around 99% correct, but without the original written records there is always a smalll chance of a slight hiccup in our observations, but this a rare occurence..
Click the above button to return to page 51 of "Can You Help"